In a debate one tactic which often works is to ascribe to your opponent a position that he does not hold, which is easy to refute, and then demolish that. Or else to quote his arguments out of context or associate him with a group who superficially might seem to be saying the same thing but actually are not. This is what is called the “straw man” fallacy presumably because you set up an argument which you proceed to easily demolish and by doing so claim you have demolished your opponent’s arguments. 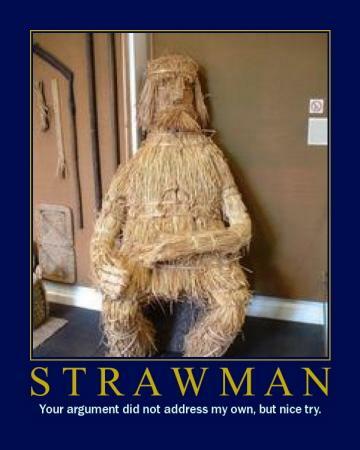 While I always enjoy reading Alex’s writings, which are frequently intelligent and provide a genuinely fresh perspective, he is guilty of deploying the straw man fallacy against me in his latest blog (“In the national conversation, some kinds of talk don’t come cheap”, http://yawningbread.wordpress.com/2012/09/30/in-the-national-conversation-some-kinds-of-talk-dont-come-cheap/). This is taken from his speech at a recent SDP forum entitled the National Conversation Roundtable (though strangely the only attendees apart from SDP were the usual civil society suspects). The main thrust of his argument was that, however much his fellow speakers might think more social spending was necessary there was no easy way to pay for it without substantial rises in taxes, in fact a doubling of rates. This argument is not new. It is in fact the conventional wisdom, or as Alex puts it “paradigm”. Any deviation from the PAP’s paradigm is termed politicization or polarization. We must avoid this at all costs because it is one step from there to gridlock followed by chaos! Yet historically societies that have tried to shut out creative destruction and competition have collapsed. Imperial China and the Soviet Union spring to mind. Thus in the 2012 Budget, the Finance Minister absurdly warned that income taxes would have to rise to 60% if we were to double healthcare spending. While I will point out some errors in Alex’s analysis later, my immediate concern is where he brings my name into the debate over how to fund increased social spending. First he quite rightly dismisses those who think that cutting ministerial salaries will release enough resources. Though this is a particularly light straw man as surely no one who reflected on it for more than a few minutes would think it was the case. The “cut ministerial salaries” line is more about anger at obscene pay packages and the lack of correlation with improvements in median incomes than about freeing up resources for increased social spending. The above question is often asked with a hint of anger. This especially as Christopher Balding and, more recently, Kenneth Jeyaretnam, have raised questions about the accounting. A more dispassionate discussion however, requires us to distinguish between asset values and annual returns on investment. Glittering though the hundreds of millions in asset value may be, spending away the principal is far from wise. We should spend no more than what we earn from investing the principal sums. There are several inaccuracies here. Firstly he puts Chris Balding first in bringing this to Singaporeans’ attention. In fact I have been drawing attention to the lack of transparency and accountability in the management of our reserves since 2009. I proposed privatizing Temasek and GIC, listing them on the stock market and handing out shares to Singaporeans as a solution (see http://sonofadud.com/democracy/are-foreign-investors-scared/ for a reproduction of my debate with YPAP about that time). More recently, in the Reform Party’s response to Budget 2012, (http://thereformparty.net/about/press-releases/budget-2012-part-one/) published on 23 February, I drew attention to the opacity of the way in which the PAP presented the budget and the discrepancies that existed, particularly the way the full surplus number was not disclosed. However, to characterise my concerns about Temasek and GIC as merely accounting issues, is a complete travesty. My concern is with the management, or rather apparent mismanagement of our reserves. As a start I worked out what the theoretical level of gross and net assets should be. My conclusions, discussed in “Where Have Our Reserves Gone” (http://sonofadud.com/2012/09/07/where-have-our-reserves-gone/) were that gross assets should be close to a trillion S$ and net assets about $600 billion as opposed to the $316 billion shown in the last SAL. I went on to conclude that one would have to reduce the rate of return earned by GIC on our Primary Surpluses and government borrowing since 1980 to about 2.5%, while keeping the rate the government pays on its debt at 3.5%, to get to the current level of net assets, once notional revenue from land sales and Temasek’s assets were taken into account (“An Unappetizing Picture”, http://sonofadud.com/2012/09/25/an-unappetising-picture/). Thus leverage seems to have had a negative effect on returns which flies in the face of what a theoretical leveraged fund should have been able to achieve over the same period. Alex completely ignores the question of why the reserves are so low or whether they have been mismanaged. Instead he sets up another straw man by criticizing those whom he says would raid the capital as an easy source of revenue for increased welfare spending. He says “we should spend no more than what we earn”. But that is precisely my point. If the reserves are being mismanaged then we are earning much less than we could be earning. Without transparency and accountability, we are getting much less than we deserve for the consumption we are forced to forego. That is why I advocated Singaporeans being given shares in the SWFs to ensure that as risks were being taken with their money they should share in the rewards. Alex points out that we are already benefiting from the Net Investment Returns Contribution to the government budget of some $7 billion a year and we cannot stretch that to $50 billion a year, which is what it would take to double government expenditure as a proportion of GDP. However, as I pointed out in “Smoke and Mirrors in the Government’s Accounts”, (http://sonofadud.com/2012/08/11/smoke-and-mirrors-in-the-governments-accounts/ ), the NIRC has come out of the reserves but then most of it has gone straight back in, in the form of Top-ups to Endowments and Trust Funds which are not spent in the current year and over which there is little Parliamentary scrutiny and accountability. In any case a 1% return from Singapore’s gross assets is very poor and if we were to raise the returns through better management then Singaporeans would see the benefits in the returns on their shares. Singaporeans need to be asking, particularly in the light of the recent investment losses, why Singapore even has not one, but two, SWFs. Singapore does not meet the criteria for the first type of SWF since we do not need to manage a windfall from any natural resources. If Singapore had expanded its domestic investment and consumption over the last 30 years it would have had smaller current account surpluses and thus smaller foreign exchange reserves needing management. MAS already has sufficient foreign exchange reserves necessary to manage the Singapore dollar. No second SWF was needed to fulfil this function. It is worth remembering that we do not have such high reserves through shrewd investment management or even a natural resource windfall but through our people going without. Through the government not providing value for money in that it took in much more than it gave back in services like education, health and insurance protection. The burden has fallen disproportionately on those least able to bear it. I am an economic liberal. I do not believe we should adopt the Swedish model of welfare state. This is despite the research suggesting that it does not harm productivity growth and may even help it, through high levels of spending on education for example. However it is hard to see why we need to continue running such large surpluses (the general government surplus rather than the Primary Balance which is misleadingly presented to Parliament every year). This is particularly true as technological change ensures that each succeeding generation is wealthier than the last. At present the general government surplus appears to be running at between 5 and 10% of GDP if we believe Singstat’s numbers. He assumes crudely that it is necessary to double government spending as a proportion of GDP in order to achieve an acceptable social safety net. However we are really only talking about substantially increasing the amounts spend on education, health and also social services. Obviously items like Defence and Home Affairs should not need increasing. As a rough estimate we are probably talking only about another $15-20 billion of expenditure annually. Even with the current poor levels of returns on our reserves this should be covered by the current general government surplus. He cannot just assume that you need to double tax rates to double revenues. In fact, as any first year economist will know, there will be second-round effects through the Keynesian multiplier. Thus part of the higher government expenditures will come back in the form of higher tax revenues through increased domestic employment and incomes. This is what is called the “balanced-budget” multiplier effect and is used in most econometric models. Increased health expenditures would to a large extent replace private expenditures that are not covered by the existing 3Ms (Medisave, Medishield and Medifund. Under a comprehensive health insurance scheme, such as I have advocated, it may be possible to achieve savings through the pooling of risks and better preventive care while preserving competition. In total the majority of Singaporeans may not end up paying much more than they do at present. The majority of Singaporeans pay little or no income tax but it would be a mistake to assume that we are lightly taxed or that we are getting value for money. The high cost of housing is the effect of the government having control over the supply of land and deliberately choosing to under-provide in the face of a fast-expanding population, again the result of government policy. In many areas we pay more than consumers in other countries for the same bundle of goods and services because of government monopolies. Median earners in other advanced countries also pay little or no income tax (we know from Mitt Romney’s gaffe that 47% of Americans pay no income tax) but they get a much better deal from their governments in terms of services provided. For the reasons outlined above I therefore find Alex’s assertion that tax rates will have to rise substantially if we are to have significantly higher investment and social spending unconvincing. It is a pity that he too seems stuck in the PAP paradigm. Even if, in extremis, they have to rise slightly, which I dispute, this is unlikely to (a) affect the majority of Singaporeans and (b) necessarily act as a drag on growth and productivity. Our record on the latter hardly serves as an advertisement for extremely low tax rates. Kudos anyway to Alex for putting the issue out there so we can at last have a rational debate, which is something the ruling party are unwilling to do. The “National CONversation” (http://sonofadud.com/2012/09/12/national-conversation/) is not about a dialogue at all. It is about a National Monologue in which they sit behind a pane of glass and warn us about the dire consequences of deviating from the PAP script while shutting out anything that they do not want to hear. With regard to “our reserves,” this simple question is waiting for an answer: How much of the reserves has been dissipated – whether as book-loss or otherwise – over the last, say, 15 years? This of course is not an area in which the govt is interested in being so-called transparent. Thus the question posed above will elicit no response. Alex likes to put his finger in everything. Admitting that he knows nuts about what KJ is talking about would be too hurtful to his ego, so the poseur has to set up his strawman and argue like his knows what is happening. A well written piece, Kenneth. The choice of words and the length of the sentences is important and your article tries to keep within the boundaries of good communication. People these days dont like to read books or overly long sentences. I suspect that Alex was just playing the devil’s advocate in that SDP seminar. I think he was just trying to stir up the participants to think about opposing viewpoints. 1 “Obviously items like Defence and Home Affairs should not need increasing”. I have argued elsewhere that expenditure on defence is, in fact, excessive and can be cut substantially without affecting Singapore’s defence needs, releasing some seven billion or eight billion dollars annually for other uses. Eishenhower and John Foster Dulles’ domino theory, which supposed that free countries in Asia would fall like dominoes if any one of them fell to communism has long been dead. Also, Singapore has been a member of ASEAN for 45 years. So where is the threat coming from? Before tax increases are considered, the PAP government should consider eschewing million dollar missiles and other unnecessary offensive weapons which, in any case, do not support the domestic economy. Indeed. Apart from the GST which taxes lower income households disproportionately, the CPF Life minimum sum scheme is also a tax on Singaporeans without, as in many European countries, providing a pension for life. Both of these are hidden taxes. A more honest direct tax on Singaporeans which guaranteed lifetime pensions based on last-drawn income rather than one that runs out when your minimum sum is exhausted and insurance-based universal healthcare is far better than such hidden taxes. Professor Balding has just published a nonsensical piece about Temasek where he clearly got some basics wrong. I wouldn’t put too much emphasis on his writings. @ Regime Change. Can you provide a link please? Read the article “The Average $52 million Temasek Employee”. It’s laughable. The man is financially illiterate. It is not simply of just cutting minister’s pay. It should be a total revamp where PAP people hold multiple directorships across GLC should be removed as it also cost ton of money. How can these people perform multiple jobs and yet claim money for directorship ? Do they really do a good job given the limited scope and time for their roles ? An enjoyable and thought-provoking read as usual, Mr Jeyaretnam. Your father would have been proud.